Union Minister of State for Home Affairs, Kiren Rijiju flagged off the eight-day Dalmia MTB (Mountain Terrain Biking) Arunachal Flight in Itanagar, the capital city of Arunachal Pradesh on Wednesday evening. Around 80 riders have set out on this enchanting ride to Mechuka, one of the most sought after tourist destinations nestled 6000 feet above the sea level in West Siang district of the State. The riders have congregated in this north-eastern state from 10 different countries across the globe, including US and Germany. India has a sizeable number of riders including few from the armed forces. Notably, there are seven riders from Arunachal Pradesh, including one woman. 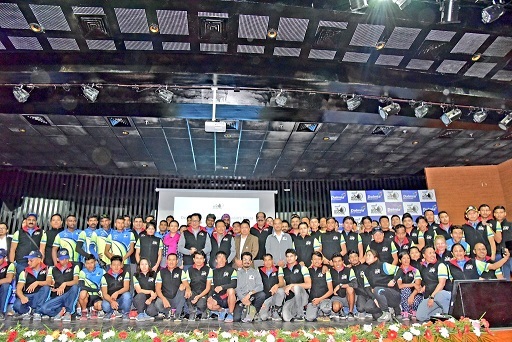 Divided into seven stages, the race starts from Itanagar on Thursday and will pass through eight districts, covering a total distance of around 650 km in eight days, before reaching its final destination, Mechuka. The race will be flagged in at Mechuka coinciding with the beginning of the sixth edition of the annual Mechuka adventure festival on November 23 next. The star attraction of the flagging in ceremony will be the presence of Bollywood superstar Salman Khan. The riders will make night stopovers at Ziro, Raga, Daporijo, Basar, Kamba and Yapik. During the flagging off ceremony, Rijiju emphasized on the need to explore the pristine and virgin tourist destinations in Arunachal Pradesh, saying that the state of Arunachal Pradesh has a lot to offer. Rijiju also urged the riders to promote the State’s tourism, its rich culture and tradition, adding that next year the event will be organized in a even more bigger way. Rijiju even took to Twitter to promote the event.